We’ve all known since that fateful Tuesday in 2001 that Sarasota had a connection to the events of the day we call 9/11. I’ve written previously about being held up by the Presidential motorcade as “W” made his way to Emma E. Booker Elementary school to read to the kids. Then there was the flight school in Venice where some of the “I don’t need to know how to land” hijackers trained. Much later, we learned some bits and pieces about the Sarasota Saudis, and—perhaps the most concerning detail—that the FBI was playing cat and mouse about what it did and didn’t know. On Monday of this week, though, a new set of documents emerged—documents that the FBI had previously failed to acknowledge even existed—that reveal even more bizarre details about the 9/11 Sarasota connection and what appears to be an FBI coverup. Thanks to some extremely diligent efforts on the part of the Broward Bulldog and their ongoing investigative and legal actions, the FBI released the documents which, although heavily redacted, reveal information uncovered as far back as 2002. An article published by the Broward Bulldog and picked up by the Miami Herald reveals the new details. They include a man dumping information into a dumpster behind a Bradenton storage facility, and a man who arrived in Sarasota, FL in November, 2001 harboring apparent intentions to purchase land and establish a Muslim compound in Florida that was (is?) feared to include carrying out or facilitating terrorist activities. The documents are available online thanks to the BrowardBulldog.org site. Those of you who know me well already know this: I’m a huge fan of entrepreneurs. Especially the “chase your dream, innovate and adapt as necessary, and work really hard ’til you see it come about” variety. And this is precisely why I was intrigued when I first met Steve Rinehart. It was about two and a half years ago now, and a good friend of mine was providing some entertainment in a local night club venue. He suggested that I meet up with the owner, because he had real vision but had run into some difficulties in the business. The venue was “The Loft Ristobar,” and it was located in the building that had previously housed Sarasota’s highly popular Tex-Mex chain restaurant, Don Pablo’s. The Loft was a concept that was either ahead of its time, or perhaps just better suited to a bigger market. But the idea, I thought, was brilliant. Restaurant by day, live entertainment venue in the evenings, and then… after hours on weekends, it transformed into a full-on night club. But, as you might imagine, those are at least two (and possibly three) different businesses all rolled up into one. This meant that the business was surprisingly complex, with lots of areas that needed specific attention. Creating a clear marketing message out of the three of them was what I was immediately tasked with doing. Let’s just say it wasn’t the easiest thing I’ve ever been asked to do. And to top it all off, Rinehart Homes, Steve Rinehart’s day job, was busy and complicated enough that it demanded lots of his time and most of his attention. The management Steve had in place at The Loft did a bang-up job, but it just wasn’t enough to get the concept to really take off. As Steve related to me, many times during the course of his time operating The Loft Ristobar, people would come in and ask about Don Pablo’s. Where did it go? What happened to it? The reality was that the Sarasota store had long been one of the chain’s top-performing restaurants. But when the parent corporation ran into financial troubles, it closed all but 38 stores—the ones that were geographically easier for them to manage. A new company bought the brand and those 38 stores out of bankruptcy and they were doing OK. The idea of coming back to Sarasota was a good one, but the company wasn’t ready to take the plunge yet as they were taking a measured approach to growth. So Steve did what any enterprising entrepreneur would do: he seized the opportunity and negotiated the chain’s first-ever franchise deal. In May of 2012, five years or so after it had closed, Sarasota’s Don Pablo’s reopened as a franchise operation. That business has been through its fair share of ups and downs, but today it is humming along with a great management team in place. Steve has high hopes for its future. In the meantime… Sarasota’s real estate market had begun to pick up. Since 1994, when Steve Rinehart first obtained his Florida General Contractor’s license, he had attacked the home-building business with gusto. Not one to get stuck depending upon others, Steve went out and got his roofing license and a pool contractor’s license as well. This enabled him to be highly flexible and churn out homes at a surprising rate. The business model is pretty simple in this world: you find a big tract of land and make a deal. Then you carve it up, stick up a model home or two, and build a community. Steve’s reputation—and that of his boutique team—in that business is very good. Over the years, he and his team have built more than 300 homes that way, and provided many affordably-priced, but very nice homes for a lot of people. But as he tells it, when the real estate market starts to heat up—especially in an intrinsically attractive market like Sarasota/Bradenton—bigger and bigger national players are willing to come in and pay far more for land than it’s worth. That makes this business less and less attractive to a boutique team like Steve’s. And so… the handful of higher-end projects that Steve had taken on in the last few years had started to become more and more interesting. With a few completely custom projects on Sarasota’s Siesta Key (along with a high-end renovation or two) under his belt, Steve decided it was time to launch another new entrepreneurial venture. With the help of 20-year veteran real estate investor Joel Match, Steve recently launched Rinehart Elite Homes. Their first project under this new name? A gorgeous home in Lakewood Ranch’s exclusive golf course community, The Concession. As you might imagine, Steve’s life is never boring. But given his passion for excellence, his hands-on attention to detail, and the track record of satisfied home owners, I think it’s safe to say that Rinehart Elite Homes is going to be a luxury home builder to contend with. For the second year in a row, Sarasota made the “Top 10” list for moving destinations in the United States. In its annual report published January 22nd, Penske Truck Rentals shows Sarasota climbing from the #10 slot last year (based upon 2012 data) to the #2 position this year (based upon 2013 data) in a new combined entry with Tampa. The company analyzes its one-way truck rentals in order to determine where people are moving within the United States. Atlanta remains the top destination in the US for this year, and the Orlando—the only other Florida city in the Top 10—holds on to its number 4 slot. Not surprisingly, Penske cites “the Northeast” and “the Midwest” as big originating points for many of these migrations. Given this year’s harsh winter conditions, it’s easy to picture this trend continuing in 2014. Why Combine Tampa and Sarasota? The report acknowledges Sarasota’s previous #10 ranking, but fails to mention the rationale behind combing Tampa and Sarasota into a single, new entry for this year’s report. I guess we can speculate that Tampa, which didn’t make the Top 10 last year, must have seen an increase throughout 2013. CNN Money apparently believes that Tampa is the only city worth mentioning, as they dropped Sarasota completely from their story about the report. HuffPo managed to get it right, including Sarasota in the #2 slot. 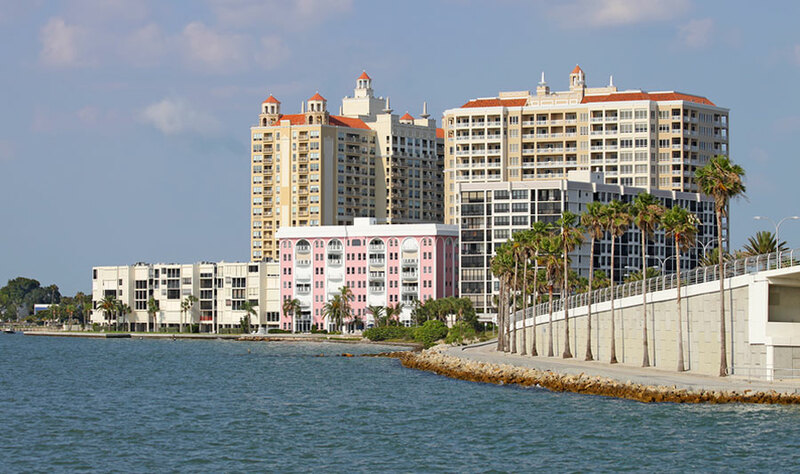 As any resident of the region knows, the Tampa market and the Sarasota market are significantly different. In an infographic published with the report (see below), Penske compares a couple of key market dynamics which they compiled from other sources. It paints a somewhat amusing picture of the region, showing Sarasota’s median income at $40,813 (6% less than Tampa’s $43,514 figure). Seeing that number compared side-by-side with the average listing price, which is $613,779 for Sarasota (compared to Tampa’s $258,675 average listing). So… on average, we make 94% of what Tampa’s residents make, but our real estate costs 2.37 times as much as theirs! Well… that’s the conclusion someone might draw who looks casually at Penske’s data, anyway. The true story, as we know, is much more complicated than that. Thanks to the perfect storm of 2008, which combined the collapse of the residential housing market and a local Sarasota economy overly dependent upon new construction, our real estate is still a jumbled mess of foreclosures, an unusually high percentage of rental properties, and vacant or abandoned houses. That mess, alongside so many high-end properties on Casey Key, Longboat Key, Bird Key, and Siesta Key (let’s hear it for the #1 beach in the US, right? ), makes for a statistician’s nightmare. In any event, it’s nice to see Sarasota make the list again, even if we were combined with Tampa to get to #2. Perhaps the real estate market will really finish its rebound! Well… one can hope, right? I’ve previously recounted my own memoirs of 9/11 in Sarasota, but as we remember the anniversary of this tragedy yet again, it seems that Sarasota’s connection to the events of that day gets stronger, if not more mysterious, every year. Recently I was on a plane chatting with someone who happened to have moved to Sarasota in the years since 9/11. Not having been a resident of the area at the time, he was only vaguely aware of President Bush’s presence in our beautiful city that fateful morning. In fact, he’d recalled “W” being in Florida, and even on the Gulf Coast, but didn’t realize Sarasota was the location. “Yep. He was in Sarasota. I saw him drive by that morning on his way to Emma E. Booker Elementary School, where he was famously reading to the children when someone whispered in his ear about the attacks,” I said. As we flew over Florida, I went on to explain that several of the hijackers trained as would-be pilots nearby in Venice—one of them famously not wanting to bother learning to land, just fly. It reminded me just how much I’ve always felt that Sarasota was eerily connected to the 9/11 attacks… and how that even that day I wondered if our city might have been a target because of the well-publicized movements of the President. But none of us who lived here back in 2001 had any idea just how strong that connection would turn out to be. We learned of the Venice connection pretty quickly, of course. But we still don’t know much about the Saudi family living in Sarasota at the time, and just how much they may or may not have had to do with the 9/11 hijackers. The Sarasota Herald-Tribune is reporting that the FBI continues its pattern of obfuscation and denial about the issue. Since the FBI has unfortunately not been forthcoming about what it knows, it is only after significant public outcry and a lawsuit that we, the people, stand a remote chance of ever learning more about the family who mysteriously vacated their Prestancia home just 2 weeks prior to the 9/11 attacks. Perhaps we may never know just how deep the Sarasota 9/11 connection goes. For now, it’s up to a federal judge in Broward County named William L. Zloch. Let’s hope he rules in favor of the people. Tom Ziglar is uniquely qualified to talk about success. For nearly all of his 47 years, Tom has absorbed first-hand the wit and wisdom of the man who is arguably the world’s best-loved motivator and success speaker: Zig Ziglar. And for the last 16 years, Tom has carried the responsibility for the success of the family business as CEO of Ziglar, Inc—America’s leading motivational and personal development training company. Tom and two of his sisters, Cindy Oates & Julie Ziglar Norman, represent the next generation of Ziglar bringing “The Ziglar Way” to a new generation of business people. With his father slowing down (the elder Ziglar last spoke publicly in December, 2010), Tom is now carrying the torch of articulating the world-famous Ziglar philosophy from the stage as well as from behind his desk. Nourish The Dream is serving as the local host for Ziglar’s “Born To Win” small business growth workshop, a one-day event jam-packed with training that will help any business owner improve operations. Florida events are coming up in Tampa on November 15th and in Sarasota on November 16th. Howard Partridge is an eight-time small business owner from Houston, Texas, who started his first business out of the trunk of his car over 25 years ago. Today that business continues to produce millions of dollars a year in revenue and operates almost completely without his involvement. “We got to know Howard and chose him to provide coaching to our small business owner clientele. He represents the highest levels of integrity and is a perfect match to the Ziglar philosophy, which is a very high standard. I’m proud to work alongside him to help small businesses become more profitable and more efficient,” says Tom Ziglar, who will be taking the “Born To Win” events to Australia with Partridge later this month. When not in front of an audience or conducting local training workshops for business owners around the globe, Tom can be found spreading the Ziglar philosophy via next-generation media like Twitter, where he has amassed a following that numbers more than 71,000 people. The full-day “Born To Win” workshop takes place on Thursday, November 15th at the Wyndham Westshore Hotel in Tampa, and on Friday, November 16th at the Homewood Suites by Hilton in Sarasota. Registration is $97, which includes a spouse or business partner, and is available by phone at 214-912-5795 or online at BornToWinFL.com. UPDATE (May, 2015): The Sarasota office of Nepsis Advisors is now known as Wealth Planning & Design, LLC. We’ve gotten word that Len Leetzow and Joni Leetzow Rametta have left Morgan Stanley Smith Barney to join the brand-new Sarasota Nepsis Advisors office. Leonard Leetzow is a 47-year veteran of Morgan Stanley Smith Barney, which makes his departure quite significant. His daughter, Joni, joined the family business at Smith Barney in 1982. According to a post on the Nepsis Advisor Services site, The Leetzow Group will be working out of the company’s Lakewood Ranch office effective today. They offices are temporarily located on the first floor of the Miles Media Group building on Professional Parkway, just south of University Parkway near I-75. The group is expected to move into their permanent offices in the Home Bank building once construction is completed approximately 120 days from now. Nepsis Advisor Services is a RIA (“Registered Investment Advisory”) based in Minneapolis, Minnesota and is planning to open additional offices around the country as other advisors are attracted to its independent culture. Many advisors—especially those in the large wirehouses—have expressed growing frustration with the stifling environments and Wall Street investment banker-dominated permission-based cultures in traditional firms. Nepsis is offering a unique alternative to the risky, “go-it-alone” switch to pure independence. The Sarasota office may be reached at (941) 361-1484.